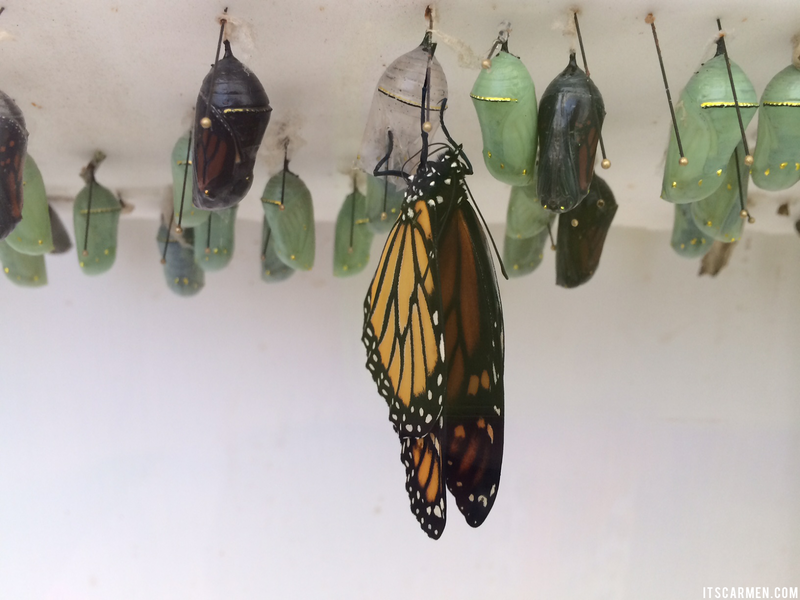 One of the most beautiful things I ever did see was the birth of a monarch butterfly. There's something so magical about a little caterpillar turning into this beautiful, intricate, delicate butterfly. The caterpillar works so hard, inching along all in effort to create his cocoon. Then he metamorphosizes into a stunning monarch capable of flying wherever his heart desires. I was on a road trip with my boyfriend. We made a stop at the Conservatory of Flowers in San Francisco. 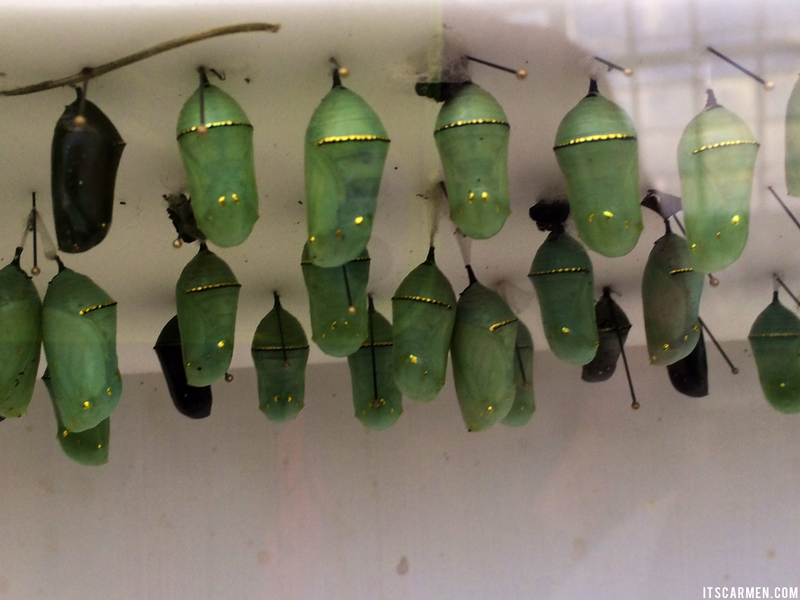 We were in the butterfly room & came across an enclosed case with emerald green & gold looking pods. I honest-to-goodness thought they were jewelry or pendants of some kind because they are so beautiful in an unnatural way, so I thought. Upon closer look, I realized that they were indeed 100% natural. They were cocoons. Butterfly cocoons. I inched closer peering at the emerald & gold pods & saw the faint pattern that is so easily recognizable as the monarch butterfly. It's just so beautiful to see this caterpillar give birth to itself in the form of a butterfly. It's complex & perplexing how they do it, but I was so very thrilled to stand there & see it unfold. He slowly wriggled out of his little cocoon sleeping bag & opened his wings. How could he fit in there? It seemed so cramped. I don't know how the world works or why, but sometimes it's these little bits of nature & earth that seem so fulfilling. 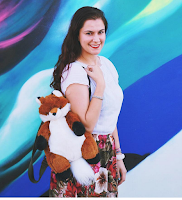 I look back at these photos & my mind immediately takes me to San Francisco. To witness beauty in such an innocent way is something that will last long within me. I liked this post very much. I never watched the birth of a butterfly but I guess it must be as amazing as you described it. :) Very cool. Amazing! I would think they truly are pendants when standing in front of them! How do they've made these golden lines? WOW...this is crazyyyy amazing. I don't think I've gotten to witness anything in nature that has left me speechless yet. Would love to see this in person one day. This is amazing! I love nature, it often leaves me speechless! One of the things that springs to mind for me is when I went on a glass submarine through the ocean, it was amazing to see life under the water, so inspiring! When I was younger, my parents used to take me to some sort of plant & garden convention in New Jersey and they would sell caterpillars there..or maybe they sold them already in their cocoons? I honestly can't remember the details because it was so long ago, but anyway we would get one every year, keep it in a special cage, wait for it to "hatch", then set it free in our backyard. The day the butterfly came out of it's cocoon was always really exciting. wow, this pictures are so beautiful! Amazing post! Such a beautiful post! Love these pictures! Wow, this is such an amazing experience...the cocoons look so beautiful! Oh wow, I honestly have seen some butterfly cocoons before but none like these. I don't blame you for thinking they were pendants, I would have thought the same too. LOL! I love the birth of a butterfly and your post is beautiful!!!! Butterflies always seemed to creep me out whenever they were close to me but I could see why their birth would be beautiful. Any type of birth is beautiful to me because it represents hope and a chance for something right to happen in the world. This is so cool! I remember when I was in grade school we got a bunch of caterpillars and watched them turn into butterflies! It is so unreal and how gorgeous are those cocoons?! Wow this is amazing! Nature is surely beautiful. Wow, what a fabulous experience! The cocoons really are emerald-like! This is beautiful, I'd love to see something like this myself one day! Wow that actually is so beautiful!